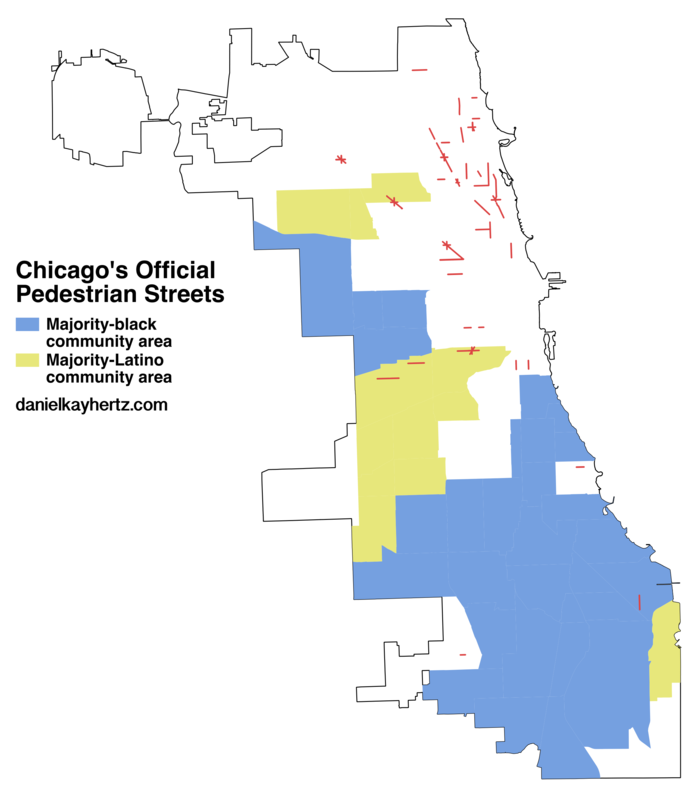 Why are there no “pedestrian streets” in black neighborhoods? It’s a bit weird that Chicago has something called a “pedestrian street designation” – after all, people walk on pretty much literally every single street in the city. But it does! Official “pedestrian streets,” which have existed since 2004, are designed to “promote transit, economic vitality and pedestrian safety and comfort” by disallowing certain things, like parking lots facing the sidewalk, and encouraging others, like storefronts and sidewalk cafes. The city’s transit-oriented development ordinance also applies up to two blocks from an L station along pedestrian-designated streets, as opposed to one block on other streets. 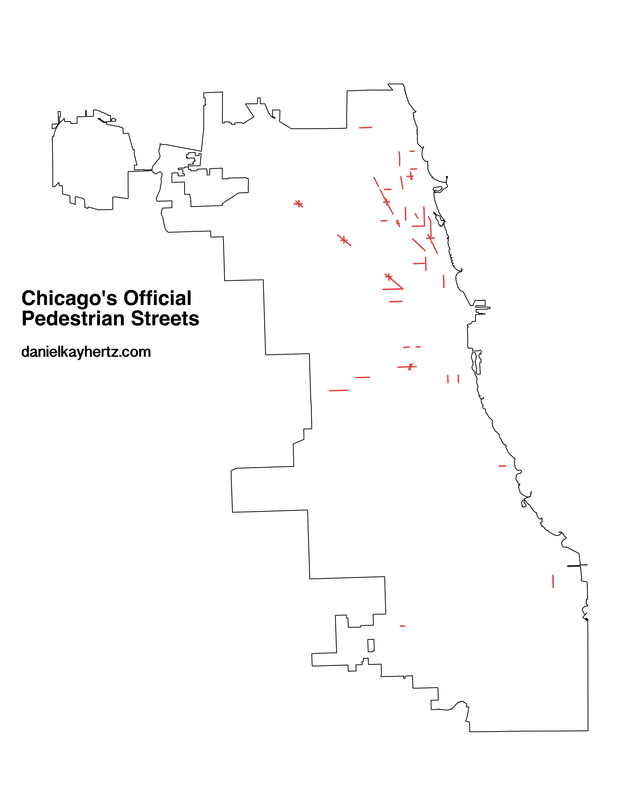 There is literally one pedestrian street in a majority-black community area: Commercial Avenue in South Chicago, between 88th and 92nd Streets. By contrast, the North Side east of the river is absolutely lousy with them; Milwaukee Ave., the retail backbone of the Northwest Side, has several large districts radiating from six-way intersections; and the Latino section of the Southwest Side, though it has way less than the North Side, at least has pedestrian designations on the busiest portions of 18th, Cermak, and 26th Streets. To be clear, the people in charge of assigning pedestrian street designations are aldermen, not CDOT. That is, the issue isn’t that the Mayor’s Office is just choosing to give North Side streets “pedestrian” status and not South Side streets. But still, it’s a pretty notable pattern. How much does this matter? I don’t know. You could observe, of course, that people in Lincoln Park, Lakeview, Uptown, West Town, and their aldermen, appear to believe that pedestrian street designations matter enough to slap them all over their neighborhoods. Alderman Ameya Pawar, for example, has been quite vocal in his belief that making commercial streets in his ward more pedestrian-friendly will improve his constituents’ quality of life and promote economic development, not to mention reduce injuries from car accidents. And although people on the South and West Sides may have different concerns and priorities, certainly one of them is economic development and thriving retail districts, which exactly the sort of thing the pedestrian street designation is designed to support. Part of the issue is that a pedestrian street designation – and the somewhat more attractive street that results – is hardly a guarantee of new businesses. Underlying economic factors and the perceptions of business owners matter much more. But a pedestrian designation is such a low-cost exercise that I’m not sure that explains it. More likely is that there’s a fear that the kind of businesses that have chosen to move into black neighborhoods – disproportionately national chains with auto-oriented cookie-cutter designs – would be deterred by rules that forced them to adopt more pedestrian-friendly formats. From one block to the next on 35th St. in Bronzeville, we go from pedestrian-friendly to not. There may be some legitimacy to that. But, for one, there’s more than enough room to place some drive-through restaurants in South Side neighborhoods while preserving and enhancing pedestrian-oriented retail streets. And for two, pedestrian-friendly design is likely best for the long-term economic health of those communities. After all, not only is the property value bonus for walkable neighborhoods well-documented, but there are plenty of South Siders who have noticed that there’s a difference between, say, Clark St. and Cottage Grove – and want to close that gap. The Pedestrian Street designation is the community being selective about its economic development – this type of retail, but THAT type of retail. If your neighborhood is starving for ANY kind of retail, it’s not going to favor restricting what kind can come in. Also, don’t underestimate the preference that still prevails in many black communities, especially in Chicago, for auto-oriented development. It stands in the face of the way commercial development is moving forward everywhere else. This has been made clear to me while working on neighborhood plans in many black neighborhoods. Residents of under-retailed neighborhoods usually head to the suburbs to do their shopping — residents of Englewood or Auburn-Gresham, for example, usually go to the Burbank/Ford City area or to Oak Lawn/Evergreen Park. Auto-oriented development has become the successful model in their mind, and the kind of pedestrian-oriented retail seen all over the North Side is viewed as the affluent exception that is to be avoided because of its lack of parking. One of the many reasons I think we’ll ultimately see the realignment of blacks from inner cities to the suburbs, and whites doing the opposite. I always viewed the P-street as a form of historic preservation, not an economic development tool. You apply it on retail streets that are already densely-developed and fine-grained, to prevent auto-oriented businesses from spoiling the character. In this light, very few South and West Side strips would even qualify – there are too many empty lots, no character to preserve. Maybe Madison in Garfield Park comes close? Things that make you go hmmm. Very thoughtful work.